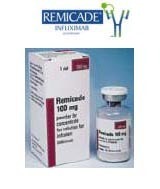 Remicade reduces the effects of a substance in the body that can cause inflammation. Remicade is used to treat rheumatoid arthritis, psoriatic arthritis, ulcerative colitis, Crohn's disease, and ankylosing spondylitis. It is also used to treat severe or disabling plaque psoriasis (raised, silvery flaking of the skin). This medication is used to treat certain types of arthritis (rheumatoid arthritis, arthritis of the spine, psoriatic arthritis), certain bowel diseases (Crohn's disease, ulcerative colitis), and a certain severe skin disease (chronic plaque psoriasis). In these conditions, the body's defense system (immune system) attacks healthy tissues. 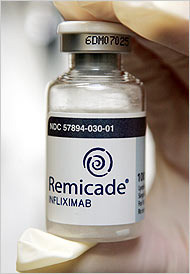 Infliximab works by blocking the actions of a certain natural substance (tumor necrosis factor alpha) in the body. This helps to decrease swelling (inflammation) and weaken your immune system, thereby slowing or stopping the damage from the disease.